03/29/2011 4:12 PM - DES MOINES – Iowa Barnstormers Head Coach and Director of Football Operations John Gregory today announced Phil Marfuggi has joined the team as its new placekicker and will play in Friday’s game at San Jose. Marfuggi, who will be playing his first season in the Arena Football League (AFL), comes to the Barnstormers from the Harrisburg (PA) Stampede of the American Indoor Football Association where in 2010 he recorded 94 kickoffs with 49 touchbacks and went 3-5 on field goals 40-49 yards along with 71-79 on PATs scoring 129 points on the season. “Phil impressed the coaching staff at our free agent camp in Des Moines last December, and I’m counting on him to restore consistency to our kicking game,” said Gregory. Prior to Marfuggi’s move to professional football, he was a highly-acclaimed soccer player earning All-American honors at Clemson University, where he starred from 2003-2006. His collegiate honors included being named team MVP and Captain in 2006 and First Team All-American by Soccer America and soccertimes.com in 2005. Following his collegiate career, Marfuggi was drafted in the first round of the 2007 Major League Soccer (MLS) Supplemental Draft and signed with the New England Revolution. 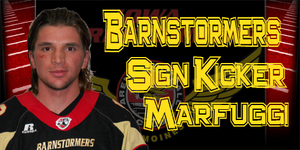 To make room on the Barnstormers active roster for Marfuggi, the Barnstormers designed Piotr Czech for reassignment. Czech served as Iowa’s placekicker for the first two games of the 2011 season. The Barnstormers (1-1) travel to California this week for a match-up with the San Jose SaberCats (2-1) on Friday, April 1 at 9:30 p.m. Iowa time. The game can be seen on AFL LIVE through NiFTyTV (webcast) at the following link: http://www.niftytv.com/afl or on www.theiowabarnstormers.com. The game can also be heard live locally on ESPN AM 1700 The Champ.